Info is a little dated though there were some wise words on trading..
PS – If you decide to join me, place limit orders and only buy a little. TPL is thinly traded, with just 20,000 to 25,000 shares traded on an average day. Good read here. The article includes a good synopsis of recent price and trust performance along with some practical thoughts about the future. Steven is still long but isn’t optimistic about near term prices due to a forecast flattening earnings and overdone investor optimism. Miller does seem positive about the long term trajectory of TPL. The water business is new and growing; it already contributes 18.1% of the revenue. How long can the growth continue? The Permian Basin Oil & Gas Magazine reported last May that producers are able to satisfy most drilling requirements with local uses of water. “That and the influx of water treatment companies have made the market ‘brutally competitive.’” The Trust has managed to thrive in that competitive environment to date, but it may not have a large moat. Projecting a stock price remains quite speculative. Given the increased focus investors have on cash flow and the projected fall in revenues, I do not expect the stock price to rise much from its current point. On the other hand, the pipelines are coming. Management is proactive. The Trust will continue buying back shares, per its charter. Management is doing something interesting with selling and buying land. The Trust remains a favorite among far-sighted investors. All these factors will keep the stock from sinking too far. Taking into account both the short-term bears and the long-term bulls, I project the stock to move sideways in a channel between $500 and $600 per sub-share (the Trust’s unique name for “shares”) for the next two quarters. Revenues for the next quarter are projected to drop. A corresponding drop in stock price is entirely possible, but long-term investors will likely use any opportunity to buy shares. The Trust will continue to buy back shares as well. Therefore, barring any catalyst, I am looking for the stock to trade in a range of $500 to $600 for the next two quarters. Traders could well find some nice opportunities in that price range. Should management have another surprise announcement, the stock could well soar again far beyond that range. Good article here on interest types and valuations. Great primer to understand an important part of TPL’s business. If buying“even slivers of royalty interests can dramatically improve the economic life of a field“, then it naturally follows that a portfolio purely of royalty interests, unblemished by cost-burdened working interests, is supposed to deliver superior economics. If you can have all the good stuff, nothing but the good stuff, why bother to own the inferior stuff? The good stuff here is the royalty interest, while the inferior stuff is the working interest. This is where the royalty companies come in. TPL differs from most if not all of the trust below by virtue of its surface land ownership. Royalties are an important part of the TPL circus but they certainly aren’t the only act. The oil royalty trusts typically produce from and gradually deplete the royalty-interest-bearing properties without asset replacement until their exhaustion. 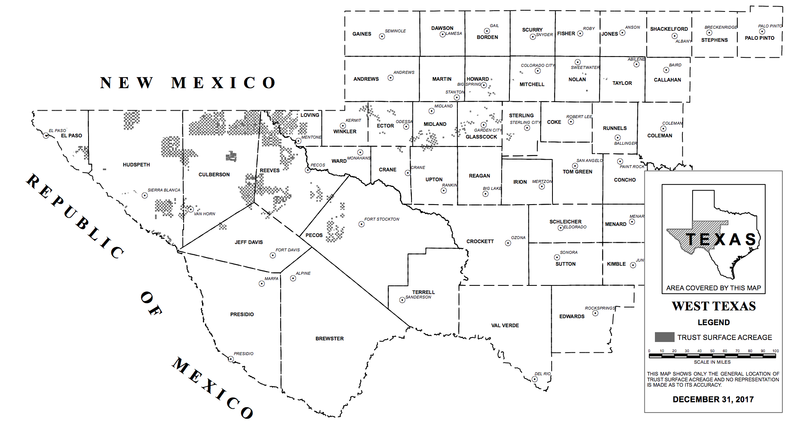 Examples of the royalty trusts include Texas Pacific Land Trust (TPL), BP Prudhoe Bay Royalty Trust (BPT), Sabine Royalty Trust (SBR), Permian Basin Royalty Trust (PBT), San Juan Basin Royalty Trust (SJT), SandRidge Permian Trust (PER), Enduro Royalty Trust (NDRO), MV Oil Trust (MVO), Pacific Coast Oil Trust (ROYT), VOC Energy Trust (VOC), Cross Timbers Royalty Trust (CRT), Chesapeake Granite Wash Trust (CHKR), North European Oil Royalty Trust (NRT), SandRidge Mississippian Trust II (SDR), SandRidge Mississippian Trust I (SDT), ECA Marcellus Trust I (ECT), Mesa Royalty Trust (MTR), Hugoton Royalty Trust (OTCQX:HGTXU), and Marine Petroleum Trust (MARPS). The authors give TPL it’s due later in the article. Nice of them to make an exception. Fee simple mineral title and overriding royalty interest last forever, while net profit interest and volumetric production payment expire along with the underlying leasehold (see here). Perpetual ownership enhances the intrinsic value of the royalty interest immensely. 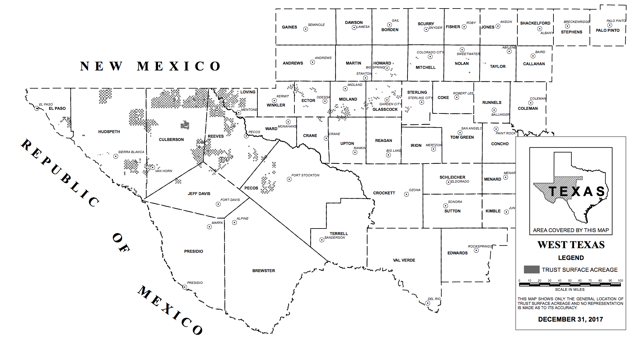 Texas Pacific Land Trust (TPL) is one of the largest landowners in Texas with 890,000 acres in the much-prized West Texas, which were previously held by the Texas and Pacific Railway Company. By retaining perpetual non-participating oil and gas royalty interests, the trust generates revenue from royalties from oil and gas and from pipeline easements and leases. The trust also generates revenue from royalties on sales of water and direct sales of water. Generally, we avoid trusts, but Texas Pacific’s sheer size makes it an exception (Fig. 7).